Like the title track that opens the disc, you can’t keep a big man down. Big Joe Maher suffered a fall in 2001 that severely injured his back and nearly ended his career. However, the big man and his band, the Dynaflows, have returned for their third swinging release on Severn Records, You Can’t Keep A Big Man Down. Maher is joined by Texas guitarist Bill Campbell, who plays bass here, along with a few members of Delbert McClinton’s band this time around, including keyboard player Kevin McKendree, who also co-produced the disc, guitarist Rob McNelley, and the late saxman, Dennis Taylor. Maher wrote or co-wrote half of the 12 tracks, including the cool title track, “Evangeline,” which steers sharply toward New Orleans R&B, the humorous “Property Line,” which sounds like a long-lost Albert Collins track, and the incredibly funky “Face The Facts.” A pair of Maher-penned tunes showcases the guitar work of McNelley. The instrumental, “Supercharger,” burns from start to finish, and the after-hours “Nothin’ But Trouble” allows him to stretch out. 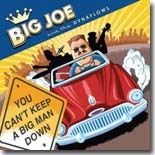 It’s good to have Big Joe and the Dynaflows back on the recording scene after a long absence. Hopefully, we won’t have to wait another decade for more of these great jumping blues. I've been a big, big Big Joe Maher fan going back to his days with the D.C.-based Uptown Rhythm Kings. After a stint with Tom Principato following the demise of the URKs, Maher started his own group, Big Joe and the Dynaflows, in the mid '90s. Other than an injury-related absence in the early part of the last decade, Big Joe has been going strong since then as witnessed by the aptly-named You Can't Keep A Big Man Down (Severn Records). Maher is living proof that a powerful vocalist doesn't always have to be at the front of the bandstand, as he doubles as a fine steady drummer with all of the various swing, blues and jazz ensembles he leads. He still sounds like Wynonie Harris when he sings --- and that's a good thing. Maher's vocal style harkens back to the days when big-voiced blues shouters were the boss, backed by tight bands with hot guitarists and "in your face" horn sections. He's backed by four very good musicians (Kevin McKendree - keyboards, Bill Campbell - bass, Rob McNelley - guitar, Dennis Taylor - sax) who combine to make the band sound much bigger than it really is. The disc kicks off on a strong note, with the title cut being an up-tempo shuffle written by Maher but sounding like it could have come from B.B. King's repertoire. Coincidentally, the next cut is a B.B. original, "Bad Case Of Love." No second string status here --- Maher acquits himself well here on vocals, while guitarist McNelley contributes the requisite Lucille-sounding guitar licks. Maher then takes us down to Louisiana for the swampy ballad, "Evangeline," that is punctuated by a great New Orleans-style piano solo from McKendree while McNelley sounds a lot like vintage Guitar Slim on guitar. McKendree switches over to organ on the funky original, "Property Line." McNelley starts off the Billy Wright cover, "Whatcha Gonna Do!," with some hot blues guitar licks; it's some of his best work on the album. This is one of the hotter numbers on the disc! The band finally slows the pace with the Johnny Green ballad, "Someday." Maher uses brushes on his drums here to accentuate the more laidback mood of this number. The jazzy vibe remains on the next cut, Jay McShann's classic "Confessin' The Blues," which has McKendree and McNelley both shining on their respective instruments. Skipping ahead, the band does one instrumental, "Supercharger," whose title describes the tempo and energy quite well. It's actually a showcase for McNelley's stinging guitar work from start to finish backed by Maher's steady shuffle beat. McNelley again plays an awful lot like B.B. on the slow blues "Nothin' But Trouble," another Maher original. This one covers some contemporary issues, too, like when Maher sings, "... they're talkin' about a bailout plan, for whom I'd like to know, sure ain't me and my friends, 'cause we're broker than before ..."
Wrapping up this wonderful CD is the uptempo shuffle, "What The Hell Were You Thinkin'?," with the whole band joining in on background vocals. McKendree rips off a red hot piano solo right in the middle of the song; he was one of the co-writers of this song, along with Delbert McClinton and Tom Hambridge. Quite frankly, I'll be surprised if I hear a better blues CD in 2011 than You Can't Keep A Big Man Down. Everything comes together here in one nice package --- a powerful singer, an excellent band, and a great mix of originals and well-chosen covers. Get it today! One important note if you go surfing for more info on Big Joe Maher --- the web address given on the CD jacket is incorrect --- it's bigjoem.com, and not bigjoe.com --- go to the latter and you'll quickly realize you're in the wrong spot.